Glass-and acrylic-walled pools play Houdini on the eyes. Designers of swimming pools that have glass or acrylic walls are taking the concept of the infinity edge to the max, creating countless cutting-edge styles that rely upon the art of transparent illusion. Called open-top windows, these pools appear to disappear into the landscape and serve as human aquariums that are just as engaging for spectators as the swimmers inside them. Although they are being created for a variety of purely pragmatic reasons – they do, for example, act as skylights in interior spaces and allow coaches and physical therapists to follow the progress of their charges – it is the “wow” fact that has led to their recent popularity among luxury property owners. The small backyard space at the condo in Dorado, Puerto Rico was used to maximum advantage; the 10-foot by 10-foot acrylic-walled pool opens up the area. It was at his client’s behest that architect José Fernando Vázquez recently created a transparent pool for a first-floor condo unit in the Ritz-Carlton Reserve at the Dorado Beach Resort in Dorado, Puerto Rico. The acrylic-walled pool in the Dorado, Puerto Rico condo provides a calming, cooling accent on the back patio. The imaginative idea proved ideal because the condo’s straight-through shotgun style makes the pool a highly visible focal point from the front door, tying it to the landscape beyond. At night, the acrylic-walled pool in the back yard of the Dorado, Puerto Rico condo unit becomes a magic lantern that illuminates the space. Acrylic walls aside, the project presented a number of engineering and design challenges. Vázquez, who early in his career had created an acrylic-walled pool for a rooftop apartment in New York City, came up with a design for a 10-foot-square pool that is three feet deep and commissioned Diamond Spas in Frederick, Colorado, to build it. The straight-through shotgun-style condo unit in Dorado, Puerto Rico allows the pool to be seen from the front door. The fabrication of the custom pool, whose high-strength, high-UV-resistant acrylic panels Diamond Spas sourced from a marine aquarium maker, took about six months. The coordination between Diamond Spas and hacedor:maker/arquitectos was key to the project’s success. The collaboration produced a creative solution for the economical storage of the mechanicals: They are installed under the wooden deck, which pulls out in sections like bureau drawers for access. When it was complete, Diamond Spas shipped the pool in a container to San Juan, where it was put on an open-platform truck and driven to the condo then transferred to a crane for delivery to the homeowner’s property. The acrylic-walled pool in Dorado, Puerto Rico comes into its own at dusk. 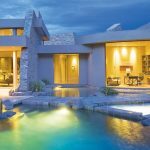 On the other side of the country, on a larger scale, Marshall Foote, a partner/general manager of Colorado Pool + Spa Scapes in Glenwood Springs, Colorado, is working with Diamond Spas to create a 9.5-foot-wide, 75-foot-long, infinity-edge lap pool and hot tub for a new-construction ski-in/ski-out residence in Vail, Colorado. Diamond Spas created the custom stainless steel vessel, which features an acrylic panel to divide the pool from the hot tub, an acrylic panel at the end of the pooland another two acrylic panels on the bottom. Foote, who has worked with the Diamond Spas staff members on many projects through the years, says they are team players. Foote is looking forward to working with Diamond Spas to push transparent pools to the next design level. Luxury Pools is a part of RMS Media Group, Inc. Copyright © 2018 All rights reserved.